We just wanted to let you know how great it’s been having Jimmy in our lives. 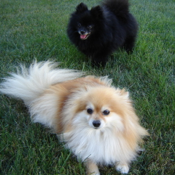 He and our other pom Elli are getting along well now although it took Elli some time to get over some shyness and jealousy. Jimmy seems very happy with us. He is always full of kisses and loves to snuggle up with us in bed. We’ve been having a bit of a housetraining issue (he’s been marking on the couch and bed) but we’re using a belly band now. He seemed to know what it was immediately and doesn’t seem to mind wearing it at all. Hopefully he won’t have to wear it much longer. We are definitely noticing an improvement. Thanks again to everyone for helping us add this little treasure to our lives!